Listen to "Madman" on your iOS and Android device. Kahlil Gibran (author of The Prophet) was a Lebanese-American philosophical essayist, novelist, mystical poet and artist. During the last 20 years of his life, he lived in the United States, where his works gained recognition and influence within the American popular culture. 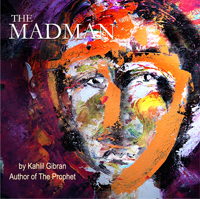 This abridged audio of The Madman communicates in stories and metaphors Gibran's belief that if a sensible way of living and thinking could be found, people would have mastery over their lives. A lovely collection of subtle, lyrical & thought-provoking poetry. The narrator, while very good, has a voice more suited to announcing an action movie or monster truck show, making it slightly difficult to sink into the beauty & spirituality of the work. Quite incongruous. A great collection of short stories, beautifully written. Amazing book and beautifully narrated. Khalil Gibran is a legend.